Stake £10 cash or more on any Casino at bet365 slot game and make your prediction during the relevant qualifying periods. The first promotion period runs from 09:00 GMT until 20:00 GMT on the 5th March 2019 and is available for the Borussia Dortmund v Tottenham match only. The second promotion period runs from 09:00 GMT until 20:00 GMT on the 6th March 2019 and is available for the PSG v Man Utd match only. 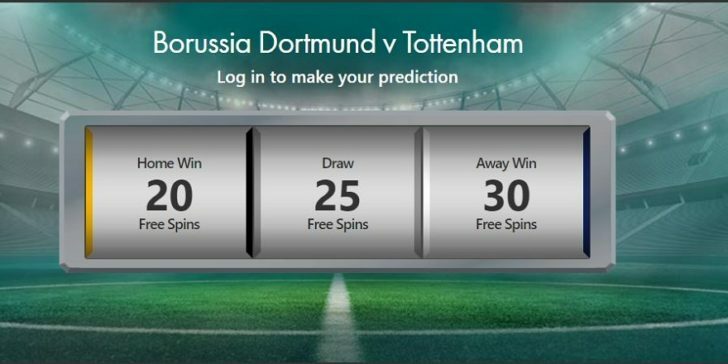 Correct result predictions for the Borussia Dortmund v Tottenham match can only be submitted during the promotional period and must be made before 19:30 GMT on 5th March 2019. To make your prediction eligible you must stake £10 cash or more on Casino slots before 20:00 GMT on 5th March 2019. Correct result predictions for the PSG v Man Utd match can only be submitted during the promotional period and must be made before 19:30 GMT on 6th March 2019. To make your prediction eligible you must stake £10 cash or more on Casino slots before 20:00 GMT on 6th March 2019. Stakes made after 20:00 GMT on 5th March 2019 will not count towards the qualifying wagering requirement for the Borussia Dortmund v Tottenham match. Stakes made after 20:00 GMT on 6th March 2019 will not count towards the qualifying wagering requirement for the PSG v Man Utd match.